Let's kick off this week full of freebies and announcements with a SWOT analysis worksheet. Add this to your marketing arsenal as a way to figure out your current place within your market. The first page of the .pdf includes a brief background on what a SWOT analysis is (lets you map out your strengths, weaknesses, opportunities, and threats), and it includes a sample filled out for a hypothetical freelance writer. The second page is a blank worksheet you can print and fill out in your own marketing planning process for your freelance writing services. 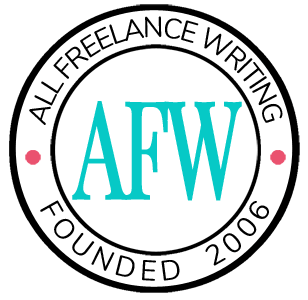 If you'd like to share this free tool with other freelance writers, please remember to link to this page or our list of resources for writers. Do not hotlink our download files directly. Thanks! Thanks for another great freebie, Jenn. I love the SWOT method: very helpful in nailing down what your marketing time needs to accomplish. Thanks for another great resource Jenn. The SWOT analysis is a good tool for finding out how your business is tracking at a point in time, and then repeating the exercise in future to assess how and where your business has changed over time. I’ve used and created SWOTs quite a bit for other types of businesses. I didn’t think it would do much for me. The filled in sample SWOT (just downloaded it to check it out), though, really helped me identify things that I didn’t think about in regards to myself in comparison to other writers, etc. What if you don’t have any weaknesses? I just crossed that out and wrote down, “Favorite Animal.” Now my SWOT has cat written on it and I’m not sure how that helps my business. @ Yo – Mine is covered with “I’m a Superstar!” Do y’all think that might bode ill for my SWOT? I think that’s better than cat ‘cuz it means you’re walking around all confident and I just want to sleep and eat tuna. @ Wolfster – One of the marketing methods many writers don’t think of is PPC (Pay-Per-Click) It’s highly effective for certain keywords but takes some experimentation and finesse to make it work in most cases. While you can get serious returns from PPC, you have to spend money to get exposure which might not be earned back for some time. PPC is tricky even for skilled marketers and can be expensive if you’re not on top of your campaign and spending all of the time. That is where a big marketing budget can pay off in a big way. Another budget buster can be taking time off from client projects (with pay) to create a marketable items such as a white paper or ebook. You lose profits while creating and then if you use it for marketing, you’ll need to set up a landing page or copy of some kind to promote it which can be expensive if you can’t do that yourself and then you can incur additional expenses if you pay affiliate commission on sales or leads to the book or (again) for PPC traffic for exposure to the book. I spent a few hundred dollars on PPC during my slow season last year. I got a couple of clients from it and they more than made up for the cost. I’ll probably roll that around again later this year. Other marketing costs could be advertising in reunion booklets or yearbooks (I target insurance agents remember :)), banner ads, business cards (design and printing), time off for networking events etc. Thank you for sharing that piece of information (PPC). I’ve received free coupons to try out google ads (I think they are pay per click), but never imagined that it would help me as a writer. I may have to give that a go before the next anticipated slow time. Sounds like a good thing to experiment with provided I put a cap on it and land a client or two. If anyone else has ideas that would cost $ for marketing and that pay off for writers, feel free to share. Your competitors use the SWOT framework by observing at yourself. You can start to craft a strategy which will help you distinguish yourself from your competitors, so you will compete successfully in your market.